There are many methods of treating fibroids naturally and one of the common methods is with the use of various herbs such as yarrow. Herbs contain various healing properties that benefit the body as a whole but also which can help address specific symptoms of uterine fibroids such as heavy bleeding and yarrow is one of the best herbs for dealing with heavy bleeding due to fibroids. What’s so great about yarrow? Yarrow belongs to the family that also includes daisy, marigold and dandelion. It is also known as bloodwort, bad man’s plaything, thousand weed, nosebleed wort, milfoil, etc and it is the leaves, flowers and stems that are used for natural healing. Several chemicals in yarrow are beneficial for treating wounds by helping with blood coagulation as well as having anti-inflammatory, antiseptic and pain relieving capabilities. Yarrow can help to relieve anxiety, stress and insomnia due to a hypnotic compound that it contains. Certain chemicals in yarrow can also help to relax the smooth muscle of the digestive tract making this herb beneficial for treating various digestive issues. This herb can also help with various other women’s issues besides uterine fibroids because it is able to relax the muscles of the uterus. If you are dealing with chronic stress, this can increase your risk of developing uterine fibroids and the worsening of uterine fibroids symptoms and many other health issues and one of the best methods of treating fibroids naturally is to eliminate or significantly reduce stress. There are various stress management techniques that you can implement and one of them is to use this herb which as mentioned above can help to relieve stress, anxiety and insomnia. Heavy bleeding can be a symptom of uterine fibroids as certain types of fibroids particularly those that reside within the wall of the uterus can increase the level of blood flow during menstrual cycles. The bleeding can be so heavy that you require medical attention. There are various herbs that can be used to control heavy bleeding due to fibroids and one of the best is yarrow because of the anti-spasmodic properties that it contains which help to relax the muscles of the uterus. It also contains properties that help spur blood coagulation and can help with pain and inflammation making it one of the best herbs for treating fibroids naturally. If you are dealing with heavy bleeding due to uterine fibroids and using yarrow for treating fibroids naturally, you may want to take about thirty drops or so of a yarrow tincture up to three times a day, two weeks before you start your menstrual cycle and continuing with the herb during your menstrual cycle. You can also use an infusion. To make a yarrow infusion, steep about 1 to 2 teaspoons of the dried herb in a cup of boiling water for about 15 minutes. Strain and drink up to 3 cups of this a day. Yarrow has a bitter and tangy taste as well as some astringency so you may want to consider adding lemon, honey or mix it with another herb such as shepherd’s purse, cinnamon, etc, to help improve its taste. For the best source for organic yarrow, click here. If using other commercial preparations, simply follow the manufacturer’s guidelines on usage. 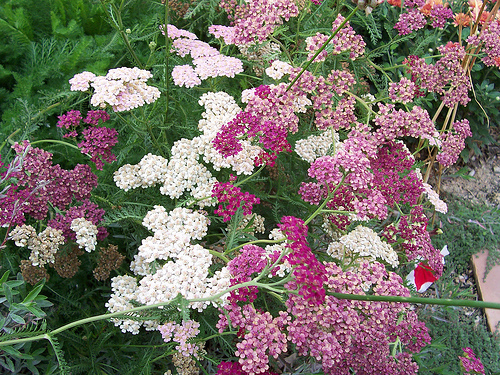 Yarrow is generally safe and can be used by anyone unless you have an allergic reaction. If you develop an allergic reaction, stop use or reduce the dose. In addition, if you consume high doses of yarrow, your urine will turn a dark brown but this is harmless and is not a cause for concern. This is just a bit of information on using yarrow for treating fibroids naturally. It is generally safe so it would not hurt to give this a try if you are struggling with uterine fibroids and if you are dealing with heavy bleeding. There are many herbs that are effective for treating fibroids naturally. Some may help with heavy bleeding or some other symptom or for shrinking fibroids, or preventing fibroids, etc. For more of the best herbs to use as well as many other natural methods that will get rid of fibroids permanently, you need the Fibroids Miracle guide. Find out more about this bestselling holistic guide here.